A talented action screenwriter (responsible for Armageddon and Die Hard 3 after all and involved in The Rock and Con Air) gets the possibility to shoot his own script and ends up presenting us with what is to be expected of a writer. Hensleigh plays it safe, offers textbook directing, doesn't take any chances and whenever there's some sort of movie magic going on, it's simply copied from other movies. No individuality. And it's almost sad when the director talks excitedly about a 50-year-old splitscreen effect, where the same actor can be seen twice in the same image. Some sure might celebrate this effort as Back to the roots or Old School, but actually it's just a proof that it's not always a good idea, to let a writer shoot his own material when the movie would be better off with an experienced director. The long runtime of the movie also shows this. Hensleigh really put a lot of effort into the story and, as mentioned earlier, he is able to write interesting characters and situations, which would make a good action movie in the hands of a good director. But Hensleigh overdoes it. There are no less than three extensive subplots in the Extended Cut - one was cut out of the cinematic version - and it seems like that without the help of the producers, Hensleigh couldn't part with any of them. Every experienced director would have managed to cut the movie down to 100 minutes for the cinematic version by removing unnecessary scenes - that would be the ideal runtime for an action movie that has relatively little action to offer. A writer probably thinks that more things are important and Hensleigh was seemingly enthusiastic when he was able to put the subplot about the traitor back into the movie and try his hands at a epilogue in Kuwait that was never shot - it's only done with animation and still photographs. The cinematic version was an unspectacular and too long comic book adaptation, which was made passable by good actors and an interesting story and gives us hope that the sequel will be improved in a lot of ways. The Extended Cut is no improvement. At least since here, The Punisher is too long. A bunch of new scenes running 15:13 minutes are featured in the Extended Cut, making it 140 minutes long. If you add the animated intro, running 4:28 Minuten, you get 144.5 minutes. A party at the "Saints & Sinners". Saint is amused by how accepted he is in the high society of Tampa. His wife enjoys this kind of lifestyle as well. Then you see Saint's sons in another room. One of them heard about the deal that is supposed to go down in an industrial area later and he is worried that his brother Bobby wants to go there without backup. Their father surely wouldn't want that. The scene where Frank says goodbye to James Weeks at the party, to return to his family in Puerto Rico, is slightly recut. He has a few extra moments with his friend, they talk about Iraq and the watch, that Frank gave to Jim 13 years ago and now he gets one from Jim as a farewell gift. When Frank walks away, he shouts back to Jim, that he please should stay away from casinos. After Howard Saint went to the morgue, the scene on the boardwalk is again slightly recut. He additionally learns about James Weeks's gambling problems and decides to get to those responsible for Bobby's death through him. Shortly thereafter, a scene is missing taking place in one of the Torro's casinos. Howard is a first time guest and both of the brothers are a little insulted because Howard didn't invite them to his place in the last ten years, although they are part of the high society as much as Howard. Howard, who's without a doubt only interested in business relations and not friendships, directly addresses his dead son, without responding to small talk. The situation remains tense. The you see Weeks outside of the casino. The younger Torro offers to kill him immediately. But Howard only wants to talk to him to learn who's responsible for Bobby's death. Weeks is lead into a side room and confronted with his gambling debts and forced into revealing Frank Castle's identity by possibly getting blamed with embezzlement. 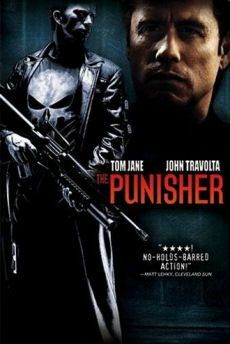 The scene, where Frank Castle suddenly returns and Weeks confronts his superior on the great stairs after the press conference, was extended for the Extended Cut, without offering any new information. After Saint had a talk with the Torros about the lost money, there's a new scene, featuring Frank and Weeks in a park. Weeks tries to convince Frank to leave the town and let him search for his family's killers. Frank refuses and wonders, what happened to Weeks's Porsche, which he has exchanged for a cheap American car. Frank doesn't know yet that he had to do it in order to pay his gambling debts. There's another scene of Weeks, after Frank kills the killer on the street. Frank tells Weeks, that he wants to leave town, but he doesn't know where to go yet. Frank notices that Weeks's watch is gone. When Weeks notices this, he says, that he has to leave immediately. Frank starts to suspect, that Weeks has something to do with the murder of his family. Shortly before Frank gets invited to a meal by the other tenants, you see short flashbacks to the moments where it dawned on him that Weeks could be a traitor. Shortly before the showdown, Frank confronts Weeks about his betrayal in his apartment. Weeks, who already suspected this moment to come, is nervous and grabs the gun that Frank seemingly left lying there unattended, threatens Frank with it, pulls the trigger several times without firing a shot and thus proves his guilt. Luckily, Frank already took out the bullets before. Weeks sees no more chance for himself and gets a single bullet from Frank to kill himself. Weeks sits down in a chair desperate, and even begs Frank to kill him. But he insists on suicide. Finally, Weeks puts the gun to his head and pulls the trigger. Frank takes his watch and puts it in the lap of the dead Weeks. You can also see the subsequently animated version of the beginning in Kuwait, where Frank and Weeks are supposed to arrest two Iraqi soldiers, who killed two UN observers. This was never actually shot because of the budget. While Weeks tries to arrest them and gets ambushed, Frank is just responsible for recon and only interacts when his buddies are in danger. He kills almost all the enemies alone and is able to arrest the assassins. The major wants to execute the prisoners right then and there but Frank tries to prevent that. One of the prisoners is able to grab and arm a grenade from the major, while the Americans are having an argument, and blows up himself and the major. Weeks is able to save Franks live at the last second. An event, which is referred to in the Extended Cut.